Supports 16:9 video stream and 16:9 HD monitor. Displays 16:9 and 4:3 videos from IP cameras on the same screen. ･ H.264 recording data in the SD/SDHC/SDXC memory card can be downloaded. ･ Convert file format from n3r (proprietary format) to MP4. ･ Online management system enables easy use without dongle. ･ Up to 100 recorders, 64 encoders and 256 directly connected cameras can be registered. Up to 6,400 cameras registered in the recorders and 256 cameras registered in the encoders are automatically registered in the WV-ASM200 (the number of the cameras depends on the recorder and encoder). ･ With WV-ASE203*1, maximum 500 recorders can be registered, up to 32,000 cameras registered in the recorders are automatically registered in the WV-ASM200 (the number of the cameras depends on the recorder and encoder). ･ Live images can be received directly from the camera/encoder or via the recorder enabling flexible network design. 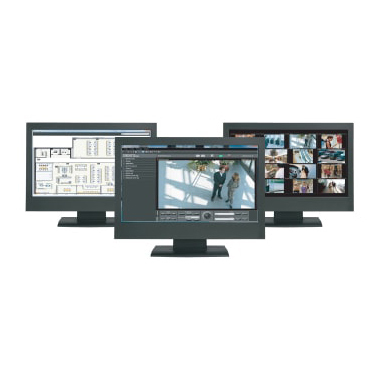 ･ Multi-Monitor option enables simultaneous use of Operation Display (1 / 4 / 9 / 16 split), Live Display (1 / 4 / 9 / 16 split) and Map Display each on a dedicated monitor. ･ Up to 16x 30 ips/camera images can be displayed in H.264 1.5 Mbps mode (VGA:Normal quality mode) or MPEG-4 2 Mbps mode (VGA: Normal quality mode, QVGA:High quality mode, depending on the camera and camera setup). ･ Up to 400 camera groups: Cameras and multiscreen mode for the Operation Display can be programmed and called up by manual or sequence operation. ･ Image resolution dynamically changes depending on the screen mode: VGA for Quad screen, QVGA for 16 split screen, enabling optimum network usage (depending on the camera model). The camera displayed in the active window can be controlled by the system controller. Recorder playback operation can also be made by the system controller with Jog/Shuttle. ･ Alarm notification: A pop-up alarm message is displayed. ･ Individual alarm reset is possible. ･ Operation Display, Live Display, and Map Display reacts correspondingly with the alarm. ･ Displays the present alarm log in red. ･ When an alarm occurs, the monitor changes into the map automatically showing where the alarm happened. ･ Recorded images of up to 64 cameras (in case with WJ-ND400) can be downloaded by one operation. Downloaded images can be viewed by the viewer software (provided). ･ System logs can be saved in CSV format. Operation logs can automatically be erased when specified time has passed (31 / 92 / 184 / 366 days). ･ Audio from a camera can be heard and the operator voice can be transmitted to the camera’s audio output through the network (single channel at a time, full/half duplex depending on the camera). ･ Recorded audio with the WJ-ND200 or WJ-ND400 or WJ-NV200 can be played back (single channel at a time). ･ Video Analytic functions of the WJ-NT314 such as intruder detection and object abandonment/removal detection can be displayed. ･ When used with WJ-ND400 series, WJ-HD716/616, WJ-NV200, VMD search can be operated. *1 WV-ASE203 4 licenses are necessary.